Our Doc Band Journey: Part Four & Final! As of last week, Gavyn is officially done with his Doc Band! 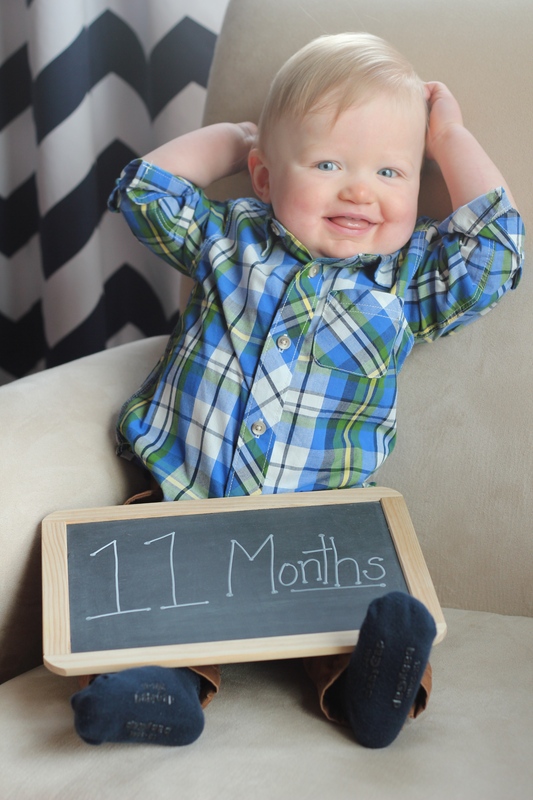 I knew twelve weeks would go by quickly, but I didn’t think it would go as quick as it did. We are happy to be done with the bi-weekly appointments and the daily cleaning of the Band, that’s for sure! Lucky guy even got to keep the mold of his head — I mean how many people can say they have a head mold from when they were a baby? Right?! Our final appointment consisted of more picture-taking and final measurements, and Gavyn was not a fan! He was a lot more still the last time than he was this time around. I was glad when the pictures were officially done, and I think he was too! 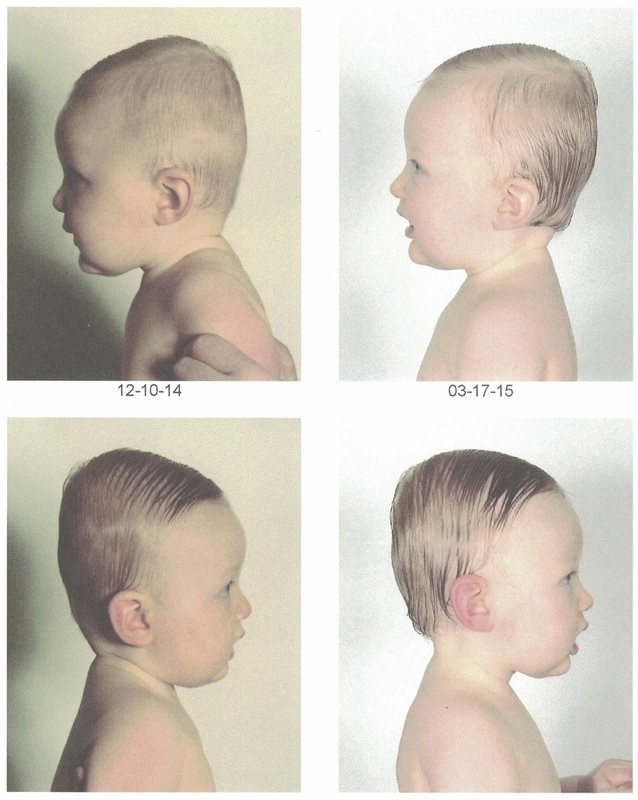 I wanted to share the “official” before and after photos of Gavyn’s head. 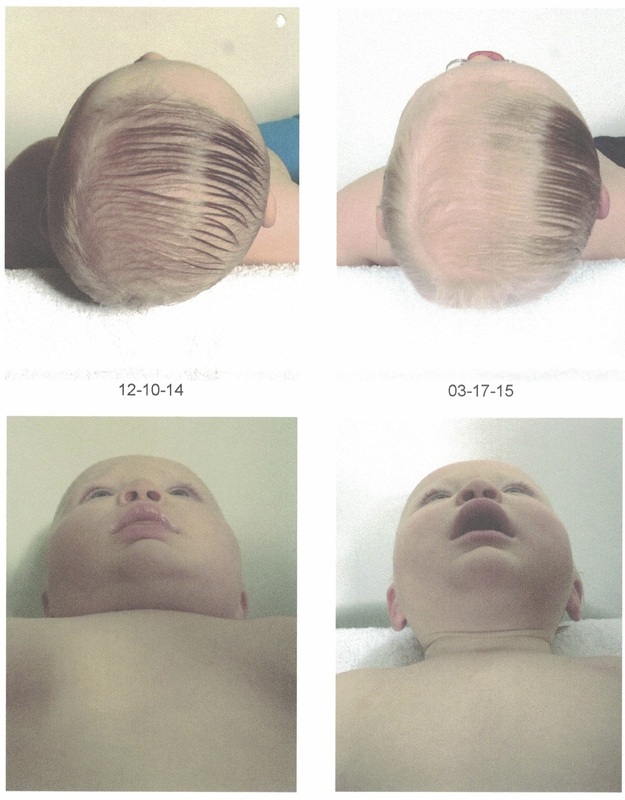 Gavyn was on the older side of getting a Doc Band, so his head is not “perfectly” shaped. He is still young and his head will continue to grow and mold, so while we achieved great improvement with the Band, there is still some remaining asymmetry. However, even given this, I would do the Band again in a heartbeat. I’m 100% positive that we made the right choice by giving it a try. 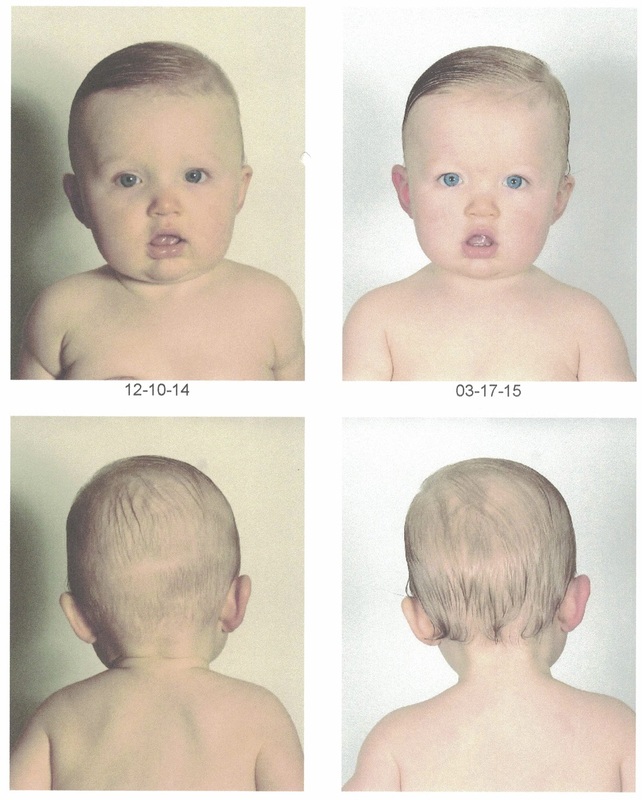 His cranial vault went from 15 mm of asymmetry to 5 mm of asymmetry. His skull base went from 8 mm of asymmetry to 4 mm of asymmetry. And his orbitotragial depth asymmetry went from 6 mm of asymmetry to 3 mm of asymmetry. His overall length-width ratio greatly improved, as you will see in the picture, as he lost a great deal of “extra” height in his head. Gavyn didn’t have much facial asymmetry so the first set of pictures doesn’t show much other than how much more grown up he got in twelve weeks! You can see more roundness on the back of his head in the second set of pictures, where he had started out with a general flatness on the whole back side. The first set of pictures here (showing his left profile), show that his head is rounder on that side than where it started out. The second set (showing his right profile), show that he lost some height on his head (see how it was pretty “sloped” to begin with?) and again gained roundness. The first set here shows the biggest improvement to me. Look how the flat part (on his right side) really filled in and rounded out when looking at his head from this angle. The second set shows how his forehead did bulge just a little bit on the right side of his face, and really went down after the Band was done. I wanted to share this whole journey with you, because I know how common the Doc Band (and other similar Bands) are today, and I am hopeful that if any of you are going through a similar situation that you will find my posts encouraging! Going into this whole process, we were pretty unsure about what to expect and I found other people’s insights to be the most helpful. I know that there are those of you who went in for a consult and chose not to do the Band, and since I believe that we all as parents are trying to make the right decisions for our kids, I am definitely not here to say that this is the only way to go. For us, the Doc Band made complete sense and was the right choice. I know that I will look back at this short time and be glad that we gave it a try! If you have any questions about our experience, feel free to contact me! Friday Favorites: Favorite Easter Basket Picks! Thank you so much for posting your story. We are at the very beginning of the doc band process. Your little man had very similar stats as out little girl. Our baby girl will be eight months when she received the band in two weeks. Seeing his before pictures and his progress is a huge reassurance that we made the right decision. Fingers crossed for similar results. I am so glad to hear our story helped reassure you! It is hard to know what the right thing is to do. I hope everything goes well for your little girl! !